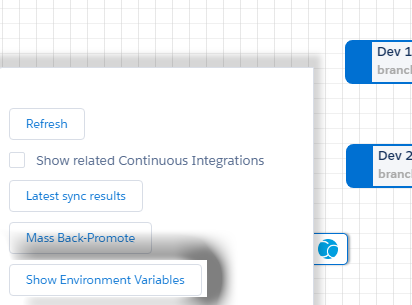 From Copado v12, you can review the environment variables linked to your deployment flow from the Release Management Page. In order to see the variables, click on the Copado logo to open the overlay menu. Then click on Show Environment Variables. After clicking on this button, you should see a modal which has all the environment variables related with every environment under current deployment flow. 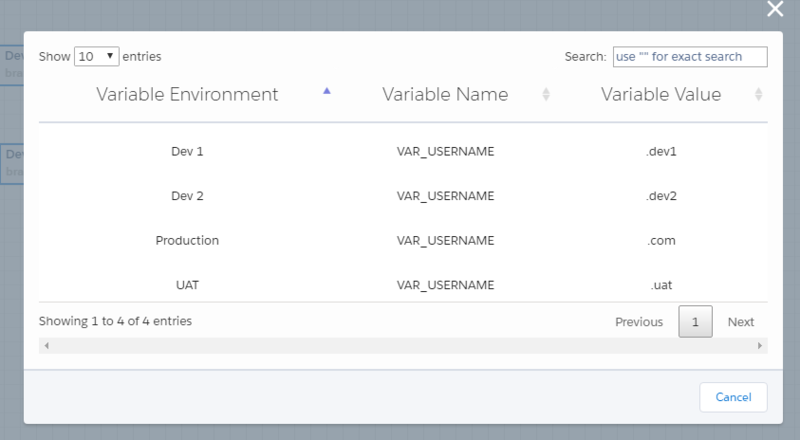 Environment variables are ordered by Variables Environment column by default. However, you can always change the order by clicking on any column. There is also a search box in the top right corner of the modal for dynamic searching. In this search box, you can search for any data under each column. If you type Dev 1 org in the search box, data will be filtered for "Dev" or "1" or "org". Don't forget to type between double quotes to search exactly for "Dev 1 org".